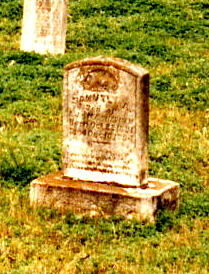 This is a small family cemetery of about ¼ acre. It is surrounded by a 4-foot wire fence and has a large gate. The grounds are well cared for but the stones could use some work. Several of the stones are knocked over. The slab from the rock quarry is shattered. It is said that a few years ago some vandals thought that all they had to do was remove the slab and they would be able to see the body. There are supposed to be black people buried in one corner. All but one of the white people buried in this cemetery are related by marriage or blood. The cemetery is listed in a book on cemeteries in north Texas as the Glass Cemetery. The Chapmans and Glasses are related and argue over the name of the cemetery. William P. Chapman, among others, is credited with naming Farmersville.